Stop by any time on your lunch break to bring your pet in for a Happy Visit. Let your pet sniff around out front and introduce them to the waiting room. 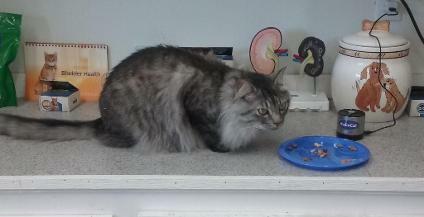 Help yourself to treats at the front counter. If we have time, we will bring your pet into a room for some playtime and more treats. You can bring your pet in for a Happy Visit as often as you would like and there is no charge! They are especially important for puppies and kittens. The dog on the right loved coming in so much that he would jump onto the counter and would start to shove his face in the treat jar! 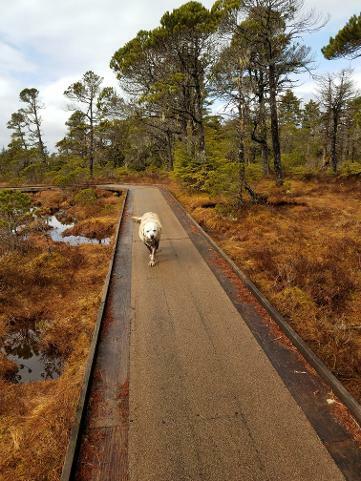 Take your dog for a long walk before his/her visit. Exercise can help to relieve anxiety. 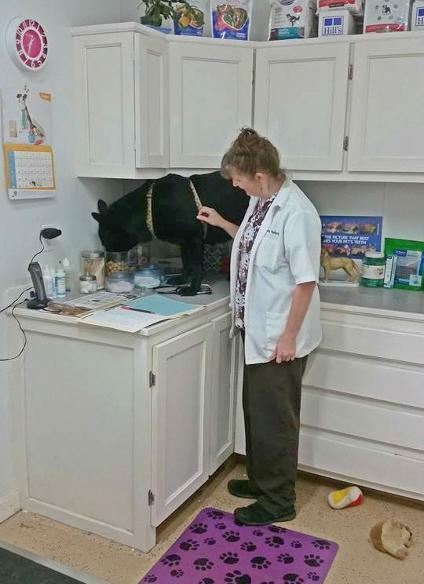 Asking your pet to perform tricks while at the clinic gives them a job and can also help relieve anxiety. If you are bringing in a cat for an exam you can play with them with toys that keep them active. We are now selling Thundershirts! They have been shown to reduce anxiety in about 80% of dogs and 60% of cats. 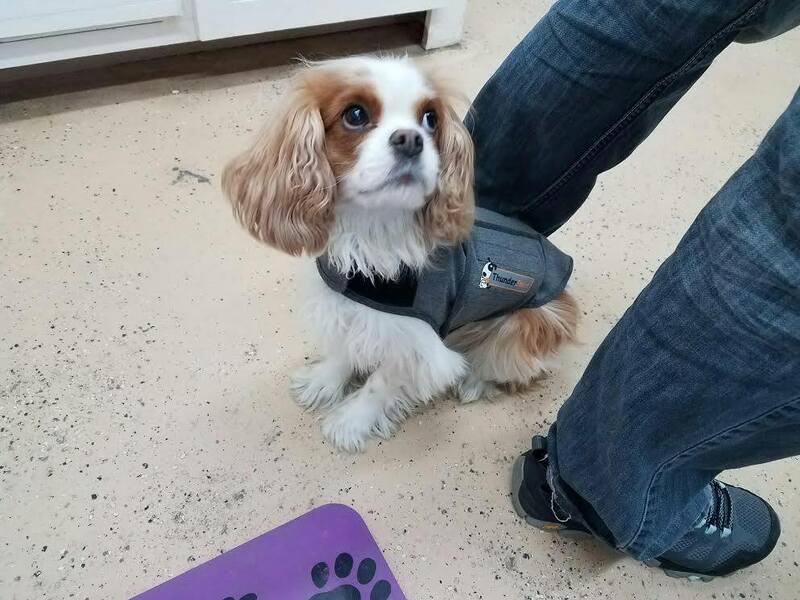 Scout's owners discovered the benefits of a Thundershirt on their own. He often wears a lifejacket when hiking because it provides the same calming compression. 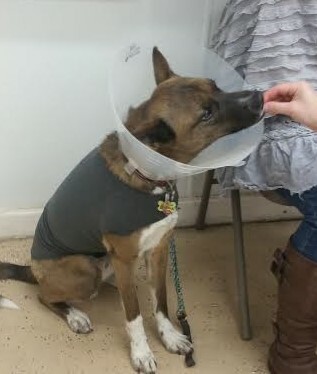 During Scout's visit, he wore a Thundershirt, listened to iCalm for dogs and received lots of treats! Each visit seems to get a little less stressful for him! The optimal crate to train with is a top removal model with two exit points: one in the front, one on top. Place comfortable bedding inside that the cat has already used, so it feels safe and promotes relaxation. Bring the crate out intermittently all year. Set it out for a week, then store it away for 2-3 weeks, then repeat the pattern. This turns the crate into a new thing to be explored once or twice a month. It can be their safe zone. Take the door off or secure it with a tie when it’s not clipped to keep it from closing or making a loud noise if bumped. 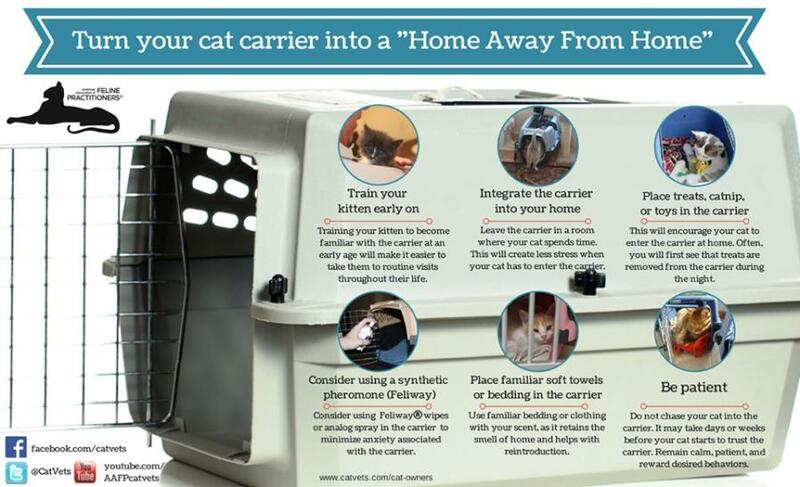 Get the cat inside by feeding meals inside the crate. For fearful cats, place food outside, but near the crate and bring closer to encourage them to peacefully eat near–and eventually inside—the crate. If comfortable, shut the door for short periods of time and reward the cat with treats, or give a long lasting stuffed food puzzle inside the carrier for them to focus on. Use Feliway, a calming pheromone that soothes anxious cats. Spritz on the inside before the cat goes in, then let dry. The effects last about five hours after spraying. Place the crate in a higher space, like on furniture, if your cat likes being up high rather than on the ground. When going to a visit, cover the carrier with a towel on the outside to keep cats from spotting scary things happening around them. When you move the carrier, hold it with both hands and lift the weight from the bottom or sides evenly and carefully without jostling or bumping in the way you could carry a fragile present. Try not to carry the crate by the top handle when your pet is inside. 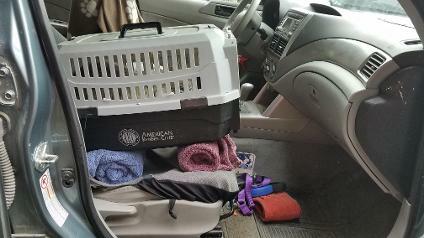 When placing the crate on the seat of the car, make sure it stays level by placing a rolled-up towel beneath it.